Actor-Director Divya Khosla Kumar graced the Lakme Fashion Week with her pastel pink saree as she walked for a designer Parvathi Dasari. Divya Khosla Kumar was seen wearing a perfectly draped pink Kanjivaram saree. Divya sported a subtle makeup with dramatic eyes and pink sindoor in her maang was looking exceptionally beautiful as she walked as a showstopper at Lakme Fashion Week. 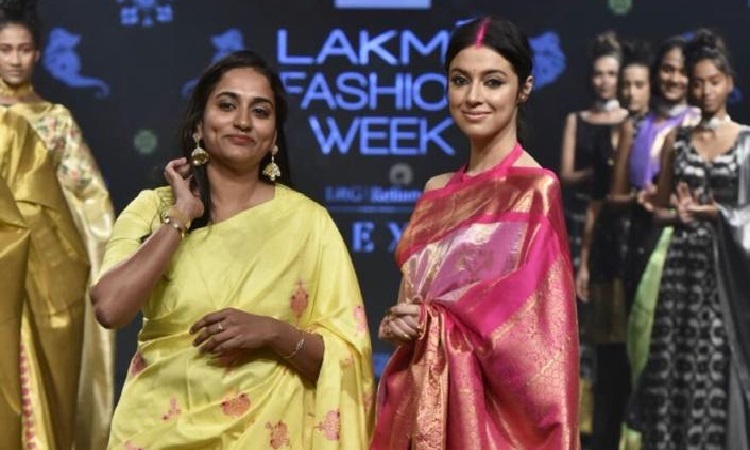 Divya had walked for many ace designer but this time she chose to walk for Parvathi Dasari who is a South based designer is famous for making handloom silk Kanjivaram sarees. It was really grateful that Divya Khosla Kumar decided to grace the show as it was the first time that Parvathi Dasari showcased her collection on such a grand scale. Previously Divya Khosla Kumar had walked for top designers like Neeta Lulla, Pria Kataria Puri, Rina Dhaka before this. Now in 2019 also Divya Khosla Kumar spilled her magic at the Lakme Fashion Week in her pink Kanjivaram.